Directions: Massage mixture into damp hair. Wrap hair in a hot towel or cover with shower cap for 20 minutes. Shampoo & rinse out. Directions: Melt coconut oil in a double broiler on low. Add other carrier oils, allow to cool then add EOs. Apply to hair, wrap hair in a towel for 30-45 minutes. Wash then dry hair. Directions: Combine ingredients then warm on low heat. Massage mixture into the scalp and hair. Wrap hair in a hot towel for 15 minutes. Shampoo & rinse out. Directions: Melt coconut oil in a double broiler on low. Add other castor oil, allow to cool then add EOs. Apply to hair, wrap hair in a towel for 30-45 minutes. Wash then dry hair. Directions: Combine ingredients then warm on low heat. Massage mixture into the scalp and hair. Wrap hair in a hot towel , leave overnight. Shampoo & rinse out in the am. Directions: Place oils in a small plastic bag and place the bag in a hot cup of water for 1 minute to warm. Apply hot oil to hair, wrap hair in a towel for 20 minutes. Wash then dry hair. Hot Oil treatments are super easy to put together and very beneficial for hair health. With these simple natural recipes, you can make hot oil treatments for dry hair, dry flaky scalp, hair growth oil and more. When using a hot oil treatment, start with clean, shampooed hair. Do your treatment, then shampoo out and condition with regular conditioner if needed as hot oils tend not to be very detangling. 2.) Heat the oil. Then apply to towel dried, damp hair. Massage to ends. You can skip applying to the scalp if your roots tend to get oily. 3.) Wrap hair in a towel or put a shower cap on. Use a blow dryer to apply heat. Heat also opens the cuticle, allowing the oil to penetrate deeply into the hair shaft. Process for given time. 4.) Rinse then wash with your regular shampoo. Use a light conditioner. Hot Oil treatments add nutrients and shine to the hair but they normally do not detangle the hair. 1.) Wash hair. 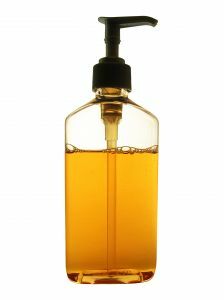 Hot oil treatments will work best on your hair if you wash hair with a clarifying shampoo. These types of shampoos will remove styling and mineral buildup from the hair and scalp. They also open the cuticle layer up, allowing the oil to penetrate the hair shaft for best conditioning results. Do not use a conditioner after shampooing.